GSK-J4 is a cell permeable, potent and selective histone demethylase. 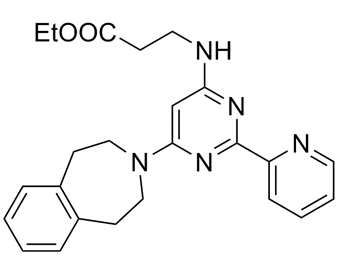 GSK-J4 is a prodrug of GSK J1, which is the first selective inhibitor of the H3K27 histone demethylase JMJD3 and UTX with IC50 of 60 nM in a cell-free assay and inactive against a panel of demethylases of the JMJ family. GSK-J4 is used to probe the consequences of demethylation of H3K27me3. GSK-J4 inhibits the lipopolysaccharide-induced production of cytokines, including pro-inflammatory tumour necrosis factor (TNF).
. Kruidenier L, et al. A selective jumonji H3K27 demethylase inhibitor modulates the proinflammatory macrophage response. Nature. 2012 Aug 16;488(7411):404-8.
. Donas C, et al. The histone demethylase inhibitor GSK-J4 limits inflammation through the induction of a tolerogenic phenotype on DCs. J Autoimmun. 2016 Dec;75:105-117.